I woke up feeling extra empowered. How did I celebrate International Women’s Day 2017? I started with visiting the website to see what was happening this year and how I could participate meaningfully. I didn’t want to just pose for a cute selfie. I really needed to see how I could make a difference in my own way. So, I registered. I downloaded a selfie card. Using one of the selfie cards (PowerPoint format), I customized it by tweaking the end of the message and adding my logo. I took my #BeBoldForChange selfie. Well, technically one of my fabulous neighbours, Earlena did it for me, since it was a wee bit awkward holding the paper sign and taking the pic at the same time. (I don’t have a tripod yet.) It was also a happy coincidence that I was wearing red, coinciding with ‘A Day Without A Woman’ being observed. I posted e-cards to women in my circle on their pages. IWD presented another opportunity to show how much I appreciate them so, I designed an IWD e-greeting just for them on Canva.com! SOCIAL MEDIA HINT: I’d start with Instagram and use the easy shareable feature to Twitter and Facebook at the same time. You can also Pin it from your Instagram page from your tablet or laptop. Quora was also a good place to share my experience. I encouraged others – especially fellow Caribbean sistas) to also recognize IWD by posting their own selfies. Dynel Lang (Island Gyal) out of St. Croix readily answered my call and quickly galvanized others. Dynel is a blogger (IslandMomsRock.com) and Founder of Iland’ista Moms, a vibrant Facebook group. Before IWD even started, we already had more women from our region joining us. I published my creative work on the IWD website. “Haitian Water Bearer” is an award-winning ekphrasis poem I thought would fit the occasion. It was published previously (and fittingly) in ‘WomanSpeak: A Journal of Writing and Art by Caribbean Women | Vol 7 2014 (Bahamas) | Editor: Lynn Sweeting. I participated in the IWD Twitter Thunderclap. At 11:30 am GMT, “across the world, and across social media platforms – this is the message global audiences world [saw]: “It’s #InternationalWomensDay !! Together we can accelerate #genderparity via action so #BeBoldForChange for #IWD2017 http://thndr.me/veUWKY” I signed up to have the one-time message sent from my Twitter account. I honoured my pledge of promoting women’s creativity. b) I answered a young woman’s call to share her thoughts on poetry. 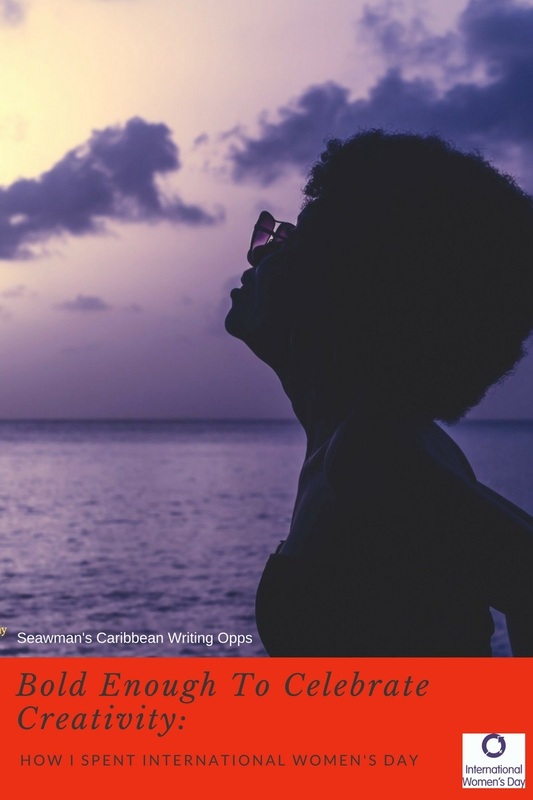 Since our region is so under-represented when it comes to finding great picture quotes, I’ve started creating and curating them in both the Facebook group I founded – Caribbean Writers – and via a shareable portal like Pinterest. Saskia Griffith is an emerging poet and member from Guyana. Every so often I update the group’s cover image with one of the quotes which remains part of a collection in an album. Today, it was great to use hers. *Sandra Sealy is Principal Consultant & Writer for Seawoman Creative Media, an award-winning literary artist and Founder of Seawoman’s Caribbean Writing Opps. 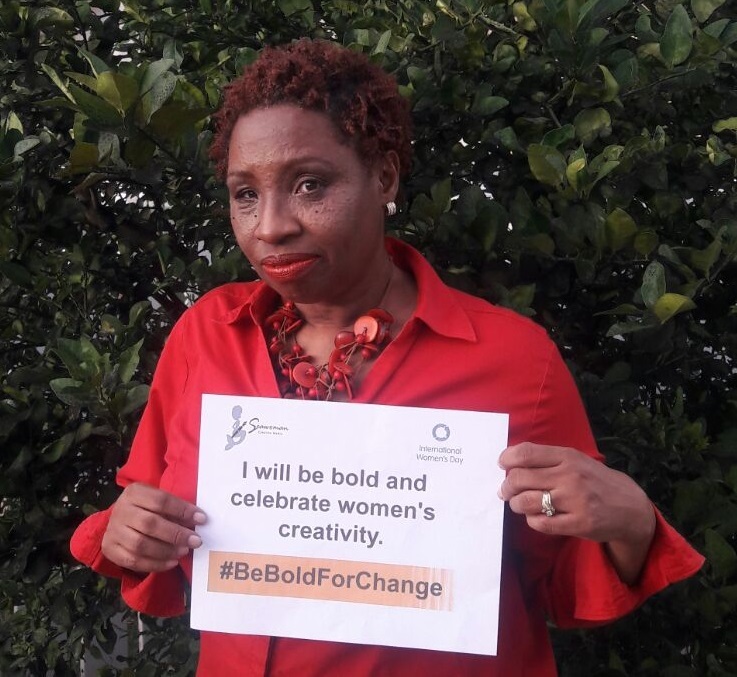 Sandra Sealy is #BoldForChange for International Women’s Day in Barbados. Posted in Blogging, Caribbean Writers, Causes & Volunteerism, Seawoman's Blog Posts. Tagged #beboldforchange, alison hinds, Barbados, barbados writer, blogging, caribbean blogger, content writer, dondre photography, dynel lang, female empowerment, international women's day, island moms rock, rihanna, roll it gal, Sandra Sealy, seawoman, seawoman creative media, seawoman creative writing opps, shontelle, social media. Great read enjoy your writing it very refreshing. Read yourarticle on Dynel Lang’s FB page I’Land Moms Rocks. I also posted my pic in suport of empowering Women throughout the world. This is awesome! Nice article. We going places!!! Awesome! I love your dedication to the cause. Dondre, Thanks for taking the time to READ my piece, respond on ALL my #socialmedia channels and allowing me to use your gorgeous “Afro Sunset” photo to create the design for the blog image. It was PERFECT on so many levels. It stands out.